On May 1, 1865, cadets from the Arsenal Academy at Columbia, under Capt. 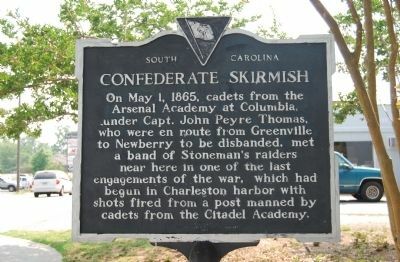 John Peyre Thomas, who were en route from Greenville to Newberry to be disbanded, met a band of Stoneman's raiders near here in one of the last engagements of the war, which had begun in Charleston Harbor with shots fired from a post manned by cadets from the Citadel Academy. Marker series. This marker is included in the South Carolina, Anderson County Historical Association/Society marker series. Location. 34° 37.115′ N, 82° 28.675′ W. Marker is in Williamston, South Carolina, in Anderson County. Marker is on West Main Street (State Highway 20), on the left when traveling south. Touch for map. Marker located near the exit of the Mineral Springs Park, visible from the Williamston Female Academy Marker. Marker is in this post office area: Williamston SC 29697, United States of America. Touch for directions. (within shouting distance of this marker); Williamston 9-11 Monument (within shouting distance of this marker); Gist Rifles Monument (within shouting distance of this marker); West Allen Williams Memorial Gravesite (about 300 feet away, measured in a direct line); West Allen Williams (about 600 feet away); Williamston (about 800 feet away); Big Creek Baptist Church (approx. half a mile away); Pelzer Presbyterian Church (approx. 1.9 miles away); "Lord, We Are Grateful" (approx. 4.8 miles away). Touch for a list and map of all markers in Williamston. 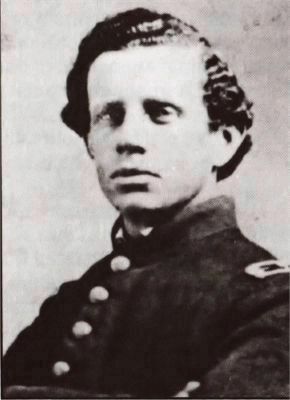 Captain John Peyre Thomas was born March 17, 1833. 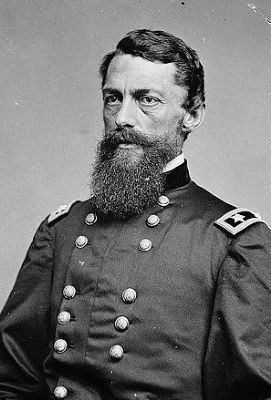 He graduated in the Citadel's class of 1851 and was Superintendent of the Arsenal during the Civil War. In the post war years, he was instrumental in working toward re-establishing the military academy. He saw his goal in 1882 when the Citadel reopened its doors. In 1892, Captain Thomas published a history of the military academy entitled The History of the South Carolina Military Academy. Capt. John Peyre Thomas died on February 11, 1912. — Submitted November 18, 2008, by Brian Scott of Anderson, South Carolina. It is an established fact, though little known, that the last organized fighting east of the Mississippi River in the War Between the States took place near Williamston. The proof of this skirmish is in the first book that was presented to the Clemson College Library: The History of the South Carolina Military Academy, by John Peyre Thomas, published in Charleston in 1893. The book was presented to the Library by Benjamin R. Tillman, and it bears out the facts that the cadets were at a point near Williamston, S.C., when the cadets had halted after a weary march, and were, many of them, asleep on their arms, when the command was fired upon, and some confusion, incident to a surprise, issued. But when the flag was displayed in the road, the command promptly rallied around it, and fire was returned by the cadets with effect. The commanding officer, upon advancing, finding that the attacking party, who were a portion of Stoneman's raiders, had retired, turned about and resumed the retreat. It was now apparent that small bands of the raiders were on all sides of the corps of cadets. But without encountering any of these parties, the corps reached Belton the day after leaving Greenville, and halting at Cokesbury and Greenwood finally went into camp at Ninety Six, whence, after remaining for a week, it proceeded to Newberry C.H. and camped at that place. Here, Captain Thomas communicated with Governor Magrath, asking for further orders, the cadets being at that time (May 9, 1865) the only organized body in arms in the state, and perhaps in the South, this side of the Mississippi River. More. Search the internet for Confederate Skirmish. Credits. This page was last revised on June 16, 2016. This page originally submitted on June 6, 2008, by Brian Scott of Anderson, South Carolina. This page has been viewed 2,027 times since then and 16 times this year. Last updated on June 18, 2008, by Brian Scott of Anderson, South Carolina. Photos: 1. submitted on June 6, 2008, by Brian Scott of Anderson, South Carolina. 2. submitted on December 14, 2011, by Brian Scott of Anderson, South Carolina. 3. submitted on November 18, 2008, by Brian Scott of Anderson, South Carolina. • Craig Swain was the editor who published this page.